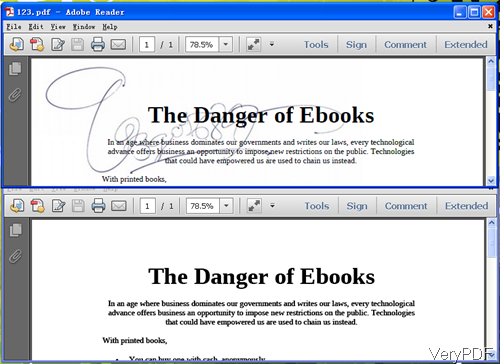 ← How can attach my signature to PDF file? How to save a picture document under PDF? When you need to save a picture document under PDF, maybe you can have a free trial VeryPDF PDF Stamp, by which you can underlay image to PDF easily. There are two versions of this software: GUI version and command line version, both of them can help you underlay image to PDF easily and accurately. An overlay is just opposite to underlay, which is built on the top of another network. By overlay, image will cover the fonts, layer or others on PDF. But underlay can help you insert a layer to the surface font and layer of original PDF file. Please search more explanation on website, in the following part, I will show you how to underlay image to PDF. Step 1. Install PDF Stamp. Here I will take the GUI version for example. When downloading finishes, there will be an exe file. Please install this software by double clicking the exe file and following installation message till short cut icon showing up. Step 2. Underlay image to PDF. Please open software interface and go to tab of PDF File List where you can add PDF file to software interface. This software allows you to add PDF as many as you need. Then go to tab of Image Stamp which looks like the above snapshot. Click button Add to add image file to software interface. After adding, the image file will be shown on the Preview Window. In the bottom menu part, you can adjust the image position, rotate angle and others. In the layer part, there are two option overlay and underlay. Please choose underlay. If you need to add some links to the added image, this software also can help you make it. Click button Action then you can add hyperlink to added image. When you need to add text layer, please go to text stamp tab. When adding text stamp, this software also allows you to overlay text and underlay text stamp to PDF file. After finish setting, please go to first tab and click button Stamp then the stamping process could be done. Meanwhile you will be reminded to choose output folder for saving output PDF file. Now let us check underlay image to PDF effect from the following snapshot. By this software and this function, we can underlay image to PDF. During the using, if you have any question, please contact us as soon as possible. How to convert pdf to big size jpg in PDF To Image Converter? Convert pcl to jpg and set color depth via command line? Who can tell me how to import pdf file into PowerPoint? How to print txt to pcx? How to print docx to pcx? How add multiple stamps in one command line? How to watermark PDF with graphic line? 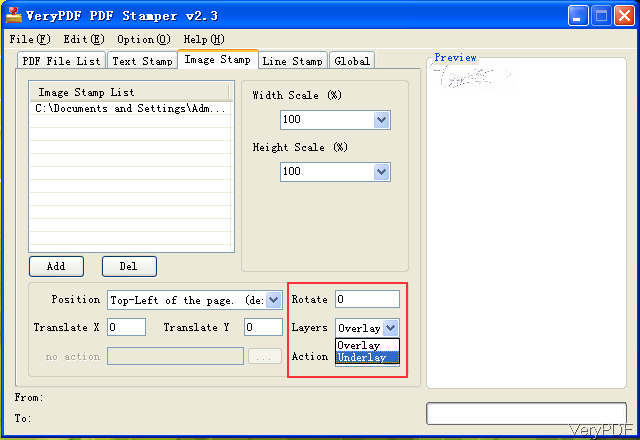 Can PDF Stamper app stamp PDF files with the filename WITHOUT the .pdf file extension? This entry was posted in PDF Stamp and tagged underlay image to PDF. Bookmark the permalink.